With increasing frequency, noninvasive, label-free microscopy methods are capturing subcellular details in live cells and tissues at ever-smaller resolutions. Understanding the complex behavior and dynamics within live cells is key to exploring biological processes. Researchers have increasingly employed novel optical microscopy techniques and devices to conduct live-cell imaging, which allows the study of dynamic processes such as cell division and protein formation in real time.1 One challenge to live-cell imaging is that live cells exhibit low contrast and an often transparent internal structure. To address this, optical microscopy relies heavily upon staining the cell with fluorescent dyes and labels, which can interfere with long-term biological dynamics. Fluorescent dyes also tend to photobleach, which limits imaging time. Figure 1a. Label-free, noninvasive microscopy methods can capture subcellular details in vivo at ever-smaller resolutions. 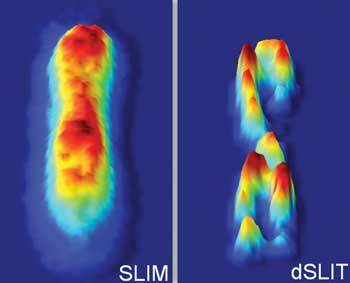 Here, the deconvolution spatial light interference tomography (dSLIT) optical microscopy technique resolves a subdiffraction-limited helical structure in live E. coli cells 0.5 µm across, an improvement on the spatial light interference microscopy (SLIM) technique. Both techniques enable subcellular imaging of live cells without contrast stains or fluorescent dyes, which can affect cellular life cycles and dynamics. Courtesy of Mustafa Mir, Gabriel Popescu and Derin Babacan. Several novel label-free methods help biologists to measure quantitative properties and dynamic processes without damaging the live cells. One approach, quantitative phase imaging, records the phase of light as it passes through a transparent or translucent object. Because this technique provides a quantitative measurement of the optical field, dyes and labels are not required to enhance the image contrast. Last year, a team of researchers led by professor Gabriel Popescu at the Beckman Institute at the University of Illinois at Urbana-Champaign successfully measured 3-D complex fields on live neurons and photonic crystal structures, using a new optical technique called spatial light interference tomography (SLIT).2 The method, a variation of quantitative phase imaging, uses a combination of microscopy and interferometry to measure the mass density of a cell in 3-D. Figure 1b. A surface map representation of E. coli cells shows the enhanced subcellular detail obtained using dSLIT processing on SLIM optical microscopy techniques. Courtesy of Mustafa Mir, Gabriel Popescu and Derin Babacan, University of Illinois at Urbana-Champaign. “This is the first time this kind of imaging has been done,” said Mustafa Mir, first author on the paper and a member of Popescu’s Quantitative Light Imaging Laboratory at Beckman. “We imaged subcellular structures in E. coli smaller than the diffraction-limited resolution of the microscope in 3-D for the first time, using only the intrinsic contrast of the sample. The practical, noninvasive dSLIT imaging technique should foster quicker turnaround times for experiments studying the basic physiology of cells such as E. coli. The research team designed a white-light quantitative-phase-imaging add-on device that can be used with many existing phase-contrast microscopes. “Our imaging method works with any brand of microscope,” Popescu said. He used the Zeiss AxioObserver Z1 phase-contrast microscope. “We put a lot of work into making this into an add-on device so many people can use it” (see Figure 2). Figure 2. The optical microscopy setup of the dSLIT technique at the University of Illinois at Urbana-Champaign incorporates the Zeiss AxioObserver Z1 phase-contrast microscope; the add-on device can be used with many existing phase-contrast microscopes, however. Courtesy of Mustafa Mir, Gabriel Popescu and Derin Babacan. The add-on device is in development at Phi Optics, a startup company founded by Popescu in 2009 and located in the University of Illinois at Urbana-Champaign’s Research Park. Phi Optics is currently co-developing the add-on device with a commercial partner. 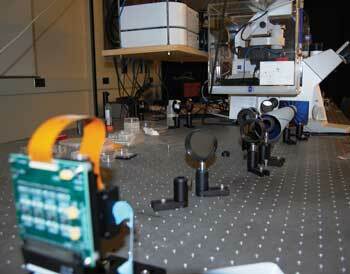 Live-cell phase-based imaging can also lend itself to 4-D video. Popescu’s team has used spatial light interference microscopy (SLIM) for time-lapse (video) measurements for several applications; it has even developed a method that measures temporal fluctuations to characterize mass transport in living cells.4 Such fast movies enable investigation of phenomena such as membrane dynamics; movies over longer periods (up to two weeks) make it possible to study cell growth, motility and neural network formation, among many other applications. Professor Natan Shaked and colleagues in the department of biomedical engineering used live video to quantitatively image a monolayer of transparent HeLa human cervical cancer cells with subnanometer accuracy (albeit laterally diffraction-limited at a resolution of 600 nm) without labeling or physical contact with the sample (Figure 3). Figure 3. Without using fluorescent dyes or other sample preparations, wide-field interferometric phase microscopy can map the dynamic quantitative optical thickness of a HeLa human cervical cancer cell during its full life cycle (19 hours) with subnanometer sensitivity. The cycle starts with the division of the mother cell (G1 phase) and continues through DNA replication (S phase), the premitotic stage (G2 phase) and new cell division (M phase). The field of view is 180 x 143 µm. Courtesy of The Optical Society, Natan Shaked and Pinhas Girshovitz. Current commercial availability of portable interferometric microscopes is limited because obtaining high-quality, stable interference patterns with modest equipment is difficult. To solve this problem, Shaked and colleagues designed the t interferometer, an inexpensive portable device that can be attached to the output of an inverted microscope to obtain spatial interferograms of microscopic biological samples.7 It can do this without the strict stability and highly coherent illumination usually required for interferometric microscopy setups. Built using off-the-shelf optical elements and operable with low-coherence illumination, the t interferometer measures the optical thickness profile with temporal stability of 0.18 nm and spatial stability of 0.42 nm. “We believe that the simplicity of connecting the device to a microscope and ease of operation will make wide-field IPM [interferometric phase microscopy] more accessible and affordable for biologists and clinicians, significantly broadening its range of applications,” Shaked said. “We are now working on better setups with higher resolution and portability, and on solving fundamental problems associated with IPM setups,” he added. 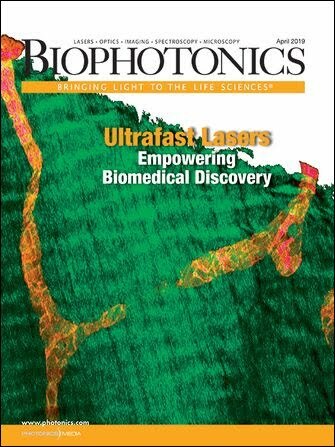 “We are also working on various new and exciting biological and medical applications that become possible using this technology, such as cancer detection and blood screening.” Further, the group has patented the t interferometer and is working toward commercialization. Another method of live-cell imaging without labels or dyes comes from X. Sunney Xie and colleagues at Harvard University in Cambridge, Mass. The group used a microscopy technique based on stimulated Raman scattering (SRS) to image the chemical composition of live cells.8 The team measured the Raman vibrational signatures of nucleic acids, lipids and proteins to reveal subcellular details of human embryonic kidney cells (HEK-293), breast cancer cells (MCF-7) and chromosomes within the salivary glands of fruit fly larvae (Figure 4). Figure 4. 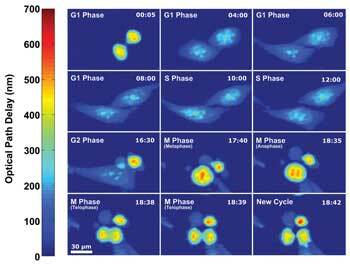 Stimulated Raman scattering (SRS) microscopy can image cells live. (a) Raman spectrum of an HEK-293 cell pellet. (b–f) Stimulated Raman scattering images of HEK-293 cells at: (b) 2845 cm–1, primarily lipid; (c) 1004 cm–1, phenylalanine; (d) 785 cm–1, nucleic acid; (e) 1090 cm–1, primarily nucleic acid. (f) Multicolor overlay of (b) – (d). Scale: 20 mm. Courtesy of Wiley-VCH Verlag GmbH & Co. KGaA, Weinheim, Germany. The technology, which offers diffraction-limited resolution of 400 nm, has commercial potential for academic research and for medical diagnostics. The team expects to reduce costs and improve portability by developing a fiber-based system. 1. Live Cell Imaging Techniques, http://www.leica-microsystems.com. 2. S. McGaughey (June 28, 2012). 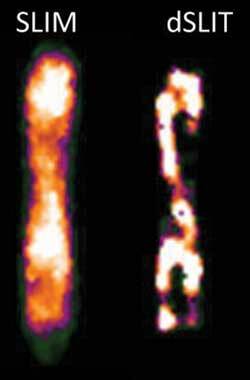 Stealthy microscopy method visualizes E. coli sub-cellular structure in 3-D. http://www.beckman.illinois.edu/news. 3. M. Mir et al (June 28, 2012). Visualizing Escherichia coli sub-cellular structure using sparse deconvolution spatial light interference tomography. PLoS One 7(6), e39816. 4. Z. Wang et al (Feb. 28, 2011). Label-free intracellular transport measured by spatial light interference microscopy. J. Biomed. Opt. Vol. 16, 026019. 5. N.T. Shaked (2012). Visualizing transparent biology with sub-nanometer accuracy. SPIE Newsroom online, http://spie.org/x87885.xml. 6. P. Girshovitz, N.T. Shaked (Aug. 1, 2012). Generalized cell morphological parameters based on interferometric phase microscopy and their application to cell life cycle characterization. Biomed. Opt. Express, pp. 1757-1773. 7. N.T. Shaked (2012). Quantitative phase microscopy of biological samples using a portable interferometer. Optics Letters, Vol. 37, pp. 2016-2018. 8. X. Zhang et al (2012). 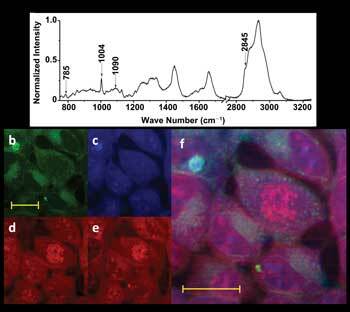 Label-Free Live-Cell Imaging of Nucleic Acids Using Stimulated Raman Scattering Microscopy. ChemPhysChem, Vol. 13, pp. 1054-1059.